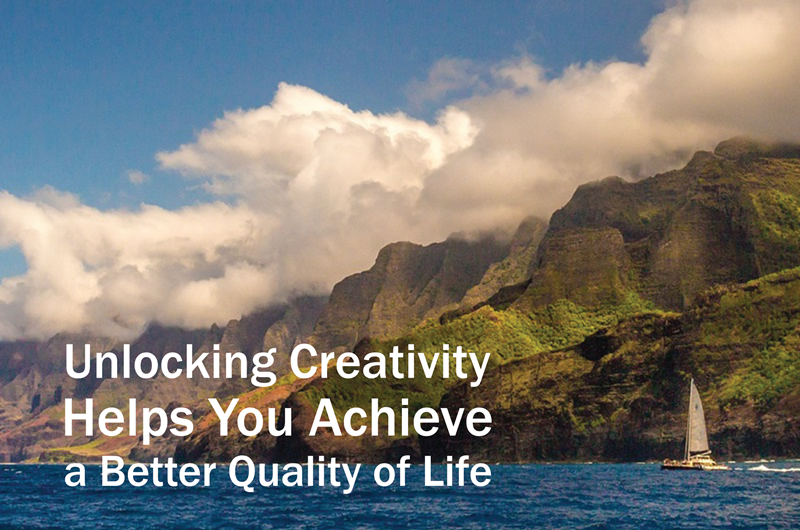 Why work on unlocking creativity? Why not spend your energy instead on improving productivity, or boosting your people management skills, or being more focused on achieving your goals? After all, productivity, leadership and goal achievement are often the main objectives of people striving toward self-improvement and a better life. The answer is this: Creativity can be one of the most powerful tools to achieve positive life changes. So whether your goal is to accomplish more at work, become a better leader, or be happier and more successful, engaging in creative habits, behaviors and practices can help you make all that happen. While everyone has a creative side, through the years, it may become difficult to access. The good news is you can work on it to reveal its power once again. Through guided meditation, you can unlock and enrich your creative spirit which may have been hampered by the distractions and duties of everyday life. Practicing guided imagery exercises will help you calm your mind clutter, gain self-esteem and empower your imagination — all of which are drivers for doing creative thinking and creative activities. The ability to shut out negative noise. Creativity strengthens your self-resolve and inner spirit. Having feelings of negativity — guilt, blame, anger etc. — is normal, but can be damaging if left uncontrolled. Your creative thinking skills will allow you to come up with solutions to control your internal thought processes. Consequently, having control inside will allow you to acquire a sense of control over your external environment, too. The strength to overcome trauma. It’s no surprise why engaging in creative activities has proven to be an effective method for therapy. Cancer patients, survivors of war, and victims of trauma have found healing and resilience through creative therapy. When a loss, an unfortunate event, or a condition such as depression happens, your creativity can help you find ways to eventually regain your strength and bounce back from the bad experience. The skill to manage conflict. Being creative allows you to see the world according to the eyes of another person. This gives you the ability to form more honest and meaningful relationships with others, whether as a leader, a subordinate or an equal. In times of conflict, your creative thinking and behaviors can be a tool for clarity, collaboration and resolution.